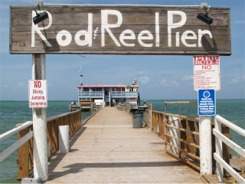 Rod and Reel Pier Restaurant is unique and off the beaten path! Eatin', fishin' & sittin' on the dock of the bay! The Rod and Reel Pier Restaurant is one of the most uniquely named and located restaurants I’ve been to anywhere. Just by looking at it you’ll get the idea! Its name isn’t the only unique thing about it though. 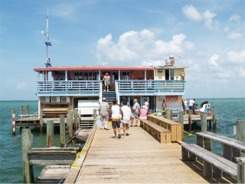 It’s both a fishing pier and a restaurant and bar in a very unique location: at the end of a fishing pier and extending out over the water of far south Tampa Bay. 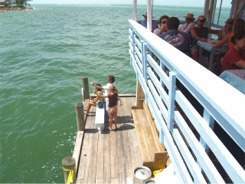 Located on the far northeast side of Anna Maria Island, the Rod and Reel Pier Restaurant is most likely the most unique of all Anna Maria Island restaurants. 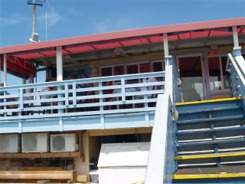 There’s a small, “squeeze-yourself-into” bar on the lower pier/deck where you can hang your head out the bar door and watch someone drop a fishing line, where you can also get both a bite and a drink and there’s an upstairs more “formal” restaurant with outside deck seating as well as an indoor dining room. However, it’s anything but “formal.” This is about as laid back of a place as you can get…once you get a table during the height of “season,” which can turn out to be a pretty good trick! Bring your fishing pole so you have something to do while you're waiting for your table. Maybe you'll catch tomorrow night's dinner! 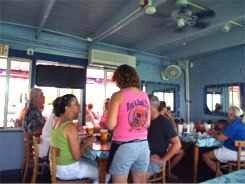 But, once you do get seated you can peruse a pretty extensive menu with both land lubber and seafood lover specialties. I figured that while in an establishment called the Rod and Reel Pier Restaurant and Bar, I best order some seafood, which is what my lunch guest did as well. 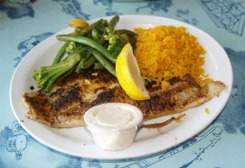 I had Grouper ($14.95), blackened (lightly). The fillet that I was served in short order was delicious; lightly seasoned and lightly blackened, light, flaky and it filled the plate. I also had delicious spicy rice (not "hot" kinda spicy, but tasty) and the vegetable of the day. The fish (Pollock) and chips ($8.95) my lunch guest ordered was just as tasty as the Grouper lunch I had and it was served with delicious chips (fries). It wasn’t a long wait from the time of ordering to delivery to our table and the meals were filling and delicious. The menu also featured scallop and shrimp specials as well as crab cakes and a selection of sandwiches and other treats other than seafood. And get this: beer on tap for $1.50 a cup. Oh boy! 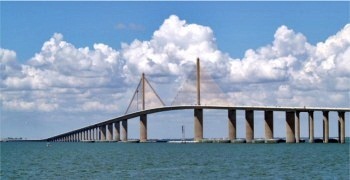 While you’re enjoying your lunch or dinner from your perch over the pier, you can gaze out the window over the water and see the Sunshine Skyway Bridge, over Tampa Bay, off in the distance to the north-northeast. Or You can look down at the pier below and watch the local fishermen and women trying to catch their dinner. 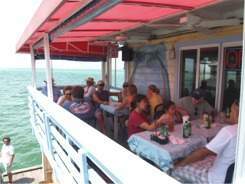 This is one of my favorite Anna Maria Island Restaurants and locations. It dates back to 1947 and I’ll bet it has survived some pretty torrential storms and hurricane seasons due to its location. 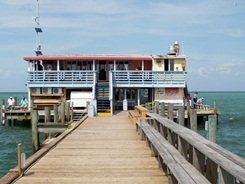 One can only guess what famous people of times past might have passed through and dined at this little piece of Anna Maria Island Florida history. But for it’s age and location it’s well maintained and the staff seems to sense that they’re serving in a special place. Quaint and cozy, The Rod and Reel Pier Restaurant’s indoor part of the restaurant on the second floor seats probably not more than 40-50 guests tops and perhaps another 15-20 are able to squeeze onto the upper outside deck. It’s small! It’s charming. It’s old Florida. You’ll love it. The prices are reasonable (my opinion!). Directions from Sarasota to the Rod and Reel Pier Restaurant: Take Rt 41 North to Bradenton to head west on Manatee Ave W (Rt 64) across Palm Sola Bay, across Perico Island and onto Anna Maria Island -- Turn right at Gulf Dr N -- Slight left to stay on Gulf Dr N -- Turn right at Pine Ave -- Turn left at Crescent Dr -- Turn left at N Bay Blvd -- Turn right at North Shore Dr -- It's a little tricky but you'll find it. Tip: Like a lot of out of the way places, parking is a challenge. The lot is small, bumpy and unpaved as of our last visit. Try parking nearby and walking, but during "high season" the parking situation could test your patience. Be prepared by allowing extra time. 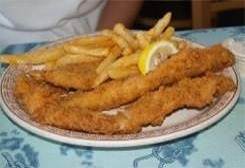 From Rod and Reel Pier Restaurant to Sarasota Restaurants Main Page.